Vivian Gunawardena has gone down in Sri Lankan politics as a dynamic woman who embraced politics long before ‘Women’s lib’ was heard of in the West. 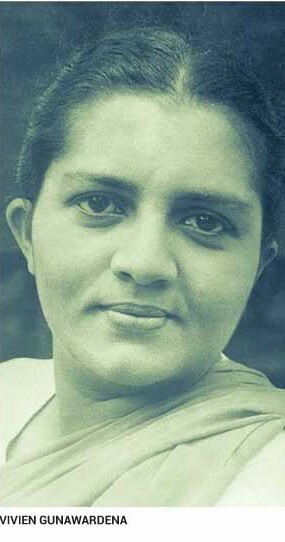 Being fearless and outspoken, a quality that she inherited from his uncle, the late Phillip Gunawardena (Boralugoda Lion), she pioneered and set up Sri Lanka’s first Socialist Women’s Organisation – The United Women’s Trust. Vivian Gunewardena’s 101st birthday or the 31st death commemoration falls on 3 October 2017. As a tribute to this outspoken, fearless female politician, the writer wishes to reminisce about a personal interview he had with her in London, at the time she cut short her holiday, purposely to take an active role on the political platform in Sri Lanka, prior to the general elections on 16 August 1994. What inspired Vivian Gunawardena to enter politics at a time when the Sri Lankan political climate was male oriented? Her father being a doctor helped her to access hospitals often when she was young. It was then, as a young girl having seen the level of suffering and inequalities associated with poverty, and influenced by her uncle Philip Gunawardena, who was aggressively involved in the anti-British movement, she became exposed to the activities of the socialist movement. She was known to be ‘rebellious’ from her younger days. She defied her father, who vehemently discouraged her entering university education, but with the backing of her two uncles, she entered the university and graduated. Even at the age of 78, she had not changed much in her attitudes and convictions. Vivian Gunawardena’s intensifying activities within the LSSP brought her to a close association with Leslie Goonawardena, the chief propagandist at the time. Finally she fell in love with him, but her father once again opposed to the match, as the two families were of different castes! Apart from formal family disagreements, Leslie Goonawardena was a Christian and a revolutionary, who was under surveillance by the British Colonial regime at the time. Vivien in her normal fashion endured it all, until finally a judicial mediation helped her to get married to Leslie Goonawardena in 1939. Vivian Gunawardena entered Parliament on the LSSP ticket between 1956–60, 1964–65 and 1970–77 and served as the Junior Minister of Health towards the latter part. She was also a member of the Colombo Municipal Council on several occasions. Being a life-long trade unionist, she dedicated her services as the President of the All Ceylon Local Government Workers’ Association until her death. We focussed next on a vital point with regard to policy decisions of the LSSP. The writer was curious to find out as to why the LSSP did not think of grooming a charismatic young leader, such as Vasudeva Nanayakkara or Wickremabahu Karunaratne for the development of the party at the time? “You mentioned the word Wickremabahu, she exclaimed! “Nothing will make me think in terms of Wickremabahu as a leader of a political party that we are aiming to create by making equality in living standards. I think Wickremabahu’s coming into this movement was accidental! Vasudeva Nanayakkara is so erratic, and he is not capable of working in an organised fashion”. You know in life quite often, you come across many things and situations where you don’t argue and try to win over the majority. You can’t do it all the time! You have to sometimes knuckle under and see how you can convince the majority, and entice them to your side without harming your party. But to leave the party and start another faction against your own party would be to lessen the future influence and the ability of that party to achieve its goals“(Sic). “There are, of course, several suitable candidates at the moment in the party, but the fact of the matter is, to become a leader of a political party, one should also be educated. And if I may give a direct answer to your question with regard to the future material, Yes, I admit, the LSSP has not achieved that important base“. Diverging our conversation into another area where the LSSP was branded as ‘trouble makers’, as back as 1956, and accused of organising various industrial strikes that crippled the progress of the country, the writer became anxious to find out how the general public could have faith in the LSSP in the future, considering such catastrophic situations of the past? “That’s very unfair and untrue,” said she, expressing that it was the LSSP, which started the union movement in Sri Lanka. ‘In the absence of a trade union movement, workers were helpless and there was no way of safeguarding the interests of the working forces; we fought for the basic pension rights and index linked wage rises to help the working classes to keep them on a par with the rising cost of living. You know, even the workers today have forgotten what the LSSP did for them! We brought development plans into the budget as we believed in actual unionism, as a working class movement, to give a better standard of living for the workers and their children“. Nationalisation of tea plantations became the next topic of conversation and how the LSSP was blamed for the introduction inappropriate legislation to curb imports, which resulted in creating numerous queues whereby pushed the general public into untold misery. It was then the people started to direct an accusing finger at the LSSP for shortsighted and closed economic policies adopted by the LSSP while sharing power with the SLFP. The LSSP had the best of brains and intellectuals, such as Dr. N.M. Perera, Dr. Colvin R. de Silva, Leslie Goonewardena, Bernard Soyza and yourself, yet the LSSP failed to make an impact on the masses for the past 50 years or so, and the LSSP was never elected to power! What would have been the missing element in the LSSP? The writer asked her finally. The answer to that question she said was due to the fragmentation within the party into ‘Communist’ and ‘Samasamajist,‘ within a very short period time. Two factions of the same party opposed each other to Stalin’s ideology in the Soviet Union while accepting socialism. The Socialism adopted by Vivien Gunawardena batch was far more superior than to what existed in Russia! This entry was posted on Sunday, October 8th, 2017. You can follow any responses to this entry through the RSS 2.0 feed. You can skip to the end and leave a response.